If you are not familiar with the Vietnamese sandwich the Banh Mi, let me tell you, it's amazing. One of my all time favorites. I've tried many renditions, but traditionally it's made with pork and has a pickled slaw of carrots & daikon with tons of cilantro and jalapeno. It's served on an airy, light baguette bread/roll with a crispy crust (not dense!). I've created a little East-meets-West situation by turning the sandwich into a burger. I've done a half-beef, half-pork combo for the meat and it's really nice with the lemongrass, garlic & ginger, etc. 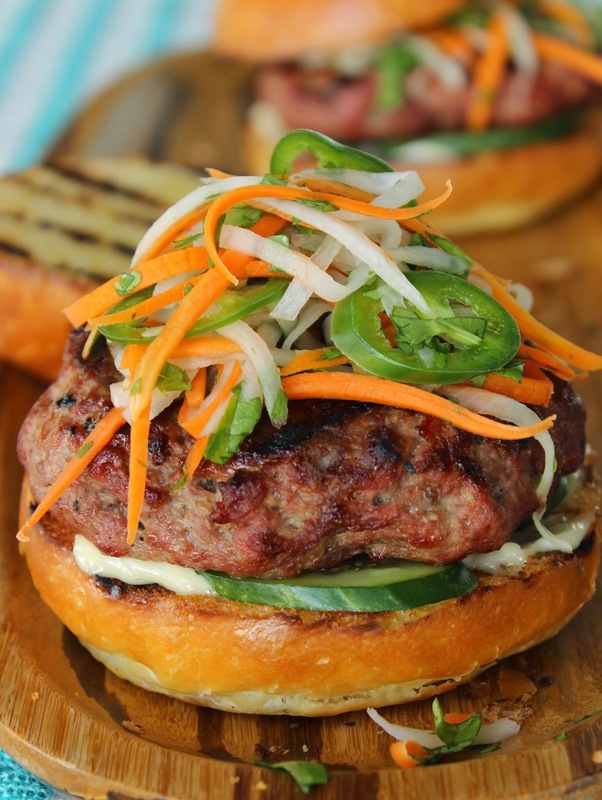 I love this Asian twist on a burger - it's quick to make, packed with veggies, and adds some interesting flava-flav to dinner. For the julienne of carrot and daikon, I highly recommend this little gadget - a julienne peeler. It makes beautiful, perfect thin strips of whatever you use it on. It's inexpensive, so quick and fun to use! Combine vinegar and sugar in a small saucepan. Heat on high until boiling, stirring until sugar is dissolved. Remove from heat and pour over shredded carrot and daikon. Allow to stand 20 minutes, stirring occasionally for even coverage. Drain veggies very well and set aside. Preheat grill on medium high for 10 minutes. In a bowl, combine beef, pork, lemongrass, garlic, ginger, fish sauce, salt & pepper. Mix very well with your hands until all ingredients are well incorporated. Divide into 4 patties and drizzle or spray with oil for grilling. Grill patties about 5 minutes per side or until a thermometer reads 145 degrees. Remove from grill, cover with foil and allow to rest 5-10 minutes. Grill buns or baguette lightly until toasty and warm. Add chopped cilantro to carrot & daikon mixture and stir to combine. Spread bread or buns with mayo. Place cucumber slices on the bottom, then add the patty and top generously with carrot & daikon and jalapeño slices.